Over 300 employees gathered at a ceremony at Shakespeare’s Globe, central London last night (24 November) for the third annual Chairman’s Awards, presented by Wates Chairman James Wates CBE, in recognition of outstanding achievement and contribution to communities. Andrew Nicholson, Project Surveyor for Wates Construction, was awarded the 2016 Chairman’s Overall Award for Outstanding Contribution in recognition of his work supporting and mentoring young people not in full-time education or employment. In particular, his support of Pursuing Independent Paths and the Prince’s Trust, in which he has mentored and supported two young people into securing a place on a college course, and gaining and maintaining employment. This year 178 nominations were made for the Chairman’s Awards, in five categories. Safety, Health & Environment: The Lloyds Property Upkeep Project Team, Wates Smartspace, for its delivery of two challenging roof replacements within live environments, achieving zero accidents and zero lost time. Creating Value: Nicky Finlayson, Account Director, Wates Smartspace, for developing a Total Facilities Management proposition resulting in two strategically important contracts being won by the business. Building Effective Relationships: David Armstrong, Construction Manager, Wates Construction, for his work outside of working hours, to develop sustainable relationships with key community stakeholders to help raise the profile of careers in construction and attract young talent into the industry. 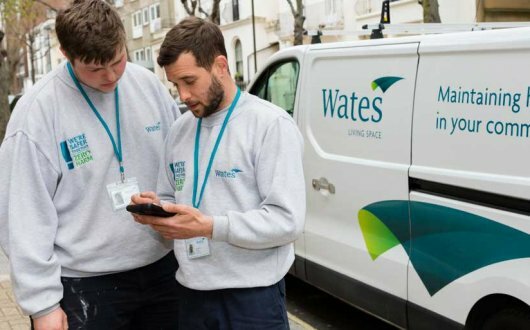 Delivering Together: Birmingham City Council Bid and Mobilisation Team, Wates Living Space, for successfully working together to deliver an exceptional bid, resulting in the appointment of Wates Living Space as one of Birmingham City Council’s biggest maintenance contractors. Community Engagement: Liam Manton, Community Investment Advisor, Wates Residential for his efforts in promoting and raising funds for CALM – the Campaign Against Living Miserably – which aims to raise awareness and support to prevent male suicide. He is also actively involved with ‘We Love Manchester’ which works to improve the opportunities and lives of disadvantaged people in the North West. “People really are at the heart of our business and why we do what we do. These awards are made by our colleagues for our colleagues and so I extend a sincere thank you to all our nominators too. James Wates CBE, Chairman, Wates Group.